This review covers 3 digital radios which are innovative for different reasons: PURE Sensia (unique colour touchscreen and apps like Facebook), KOGAN Deluxe (packed with features and stereo sound for less than $200) and BUSH Walker (very small and light portable pocket DAB+ radio). I’ve been interested in Digital Radio in Australia since it launched in mid-2009 and have reviewed several budget, mid-range and high-end digital radios. Unlike the three radios reviewed in this article most DAB+ digital radios sold in Australia differ a bit from each other in price and features but aren’t very innovative. Few digital radios could be called “Cool” but the PURE Sensia certainly qualifies with it’s unique colour touchscreen interface, internet connectivity and ability to run applications on screen like Weather, Facebook, Twitter and soon Picasa photo galleries. If you get bored with the range of DAB+ radio stations available in Australia you can listen to thousands of podcasts and streaming internet radio stations using the PURE Sensia’s WiFi connection to access the “PURE Lounge”. However this means you have a tricky decision to make when deciding whether to buy the PURE Sensia because evidently a lot of effort has been put into the striking physical design and 5.7″ inch (640x480px) colour touchscreen but this is at the expense of audio quality which is not as good as the slightly cheaper and more plain PURE Evoke 2S digital radio which has exceptional audio quality. Note that the touchscreen is as easy to use as a modern smartphone like iPhone/Android phones but it isnt quite as fast and responsive. Also the power button just above the screen is located in a way that resting your hand on top with the lightest touch can turn the radio on/off when you didn’t mean to. The PURE Sensia is available in black, white or more exuberant yellow or red colours to match your decor and comes with a nice curved remote (pictured). The PURE Sensia has a $749 recommended retail price but you should be able to find it sold at retailers like Ryda for roughly $630 including delivery. Kogan concentrates on manufacturing consumer audio/visual consumer electronics products which are value for money and the KOGAN Deluxe radio offers value in spades since it’s the only sub-$200 stereo DAB+ digital radio sold in Australia with so many features. Particular standouts are Stereo speakers (at this price point digital radios usually have 1 mono speaker), WiFi and Ethernet connectivity to access internet streaming radio/local network file streaming audio files, iPod/iPhone dock and large OLED multi-line screen which displayed menu and audio information in orange letters which matches the jet black radio finish nicely. Sound quality from the stereo speakers and front tweeter is certainly powerful with decent bass but lacks finesse at the high end. Also because the stereo speakers are side mounted the KOGAN Deluxe radio has to be in an open area, you can’t place it in a home theatre cabinet with partitions on either side blocking the speakers. The KOGAN Deluxe uses two rings of buttons, one inside the other to manage all the radio functions and this generally works well except when navigating through 1000’s of song files on the local network when using a knob would be faster. A credit card sized remote is included but it looks very cheap. 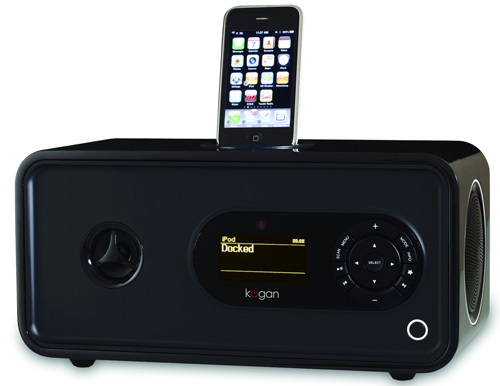 The KOGAN Deluxe (Wi-Fi DAB+ Digital Internet Radio With Iphone Dock) is currently sold for $199+delivery. If Kogan continues with their strategy of dropping their prices for products over time it will be even cheaper 12 months from now. 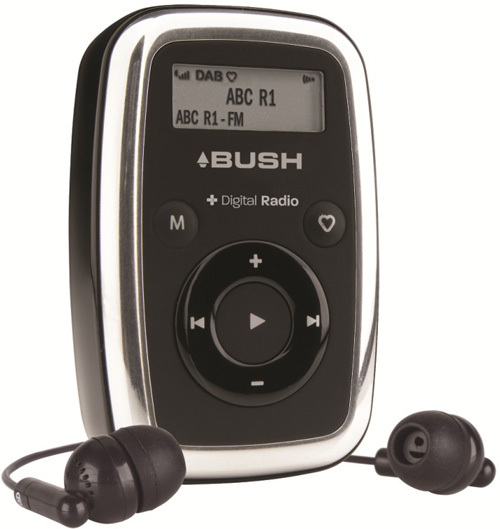 There are very few DAB+ digital radios sold in Australia which call themselves “portable” but the Bush Walker BPR07DAB is the smallest and lightest available by a longshot with a similar size/weight to a matchbox so it easily fits in the palm of your hand or pocket. The Bush Walker managed to tune all 39 digital radio stations currently available in Sydney once earphones were plugged in (it uses them as antennae). It rarely dropped the audio signal whether in my office, outside while walking or on the bus and achieved close to its stated 10 hour battery life. Although it has a small screen the BUSH Walker manages to display the current station name, scrolling program information, battery and signal strength as well as whether you have it set to FM or DAB+ digital radio mode. Overall a big thumbs up due to its size and simple menus because it is amazing that BUSH managed to output decent audio quality with 2xAAA batteries taking up most of the internal space inside the radio case. The Bush Walker BPR07DAB has a $129 recommended retail price but if you buy it from a retailer who stocks BUSH products you should be able to knock that down to $110. DAb radio does open up a larger choice of stations to listen to, and can be relatively cheap – but it has it’s problems. Personally, I think audio reception is poor and the fact that smaller radios cannot reproduce stereo is a big reason why I’ve avoided buying my own DAB radio. There are choices out there, such as internet radio – this is my preferred option for listening to broadcasts. Borders don’t limit the choice of the end user through internet radio. Some radio broadcasts are poor due to bandwidth issues, but their are many out there that broadcast at a high bit rate. EDITOR: good question. There weren’t any live sports on the radio stations I listened to during the testing period. However as a general rule *all* digital radios have a 3-4 second transmission delay. I have heard that it is really a pain to search for your desired radio channels from the net. How easy is it on Kogan Delux? I received my Kogan KGNDRVBA radio yesterday, although not the top of the line model but it is everything I expected & wanted. A solid feeling, feature packed unit with easy setup, most acceptable clear sound (also has RCA jacks for external amp) for my purposes. You can even adjust the brightness level of the display so makes a great bedside unit with the variety of listening options & the inbuilt alarm. Although not a small sized radio it looks good, If you want a well priced & featured unit you will not go wrong purchasing one of these units. Bush Walker BPR07DAB is really amazing, just bought that one later and it’s really good. Great sounding radio, but is keeping me broke by using 2 batteries a day. Why is this when my old mono used 1 battery every 3/4 weeks ?? The Bush Walker DAB radio is fine outside but it can suffer a bit if you’re under a tiled roof in a medium to poor digital reception area and you’re using the standard headphones. I have found that by using headphones with a much longer lead the reception improves indoors. And I’m sure that they don’t cost anywhere near $120 to make in China! I bought one of the portable Bush handheld radios. Did you get stereo sound for stations transmitting at 48K? With the exception of Newsradio I can get stereo for all 48 K stations on another model Sangean. I’m going to have to agree with Tom on this one. The price for the Bush Walker is a little steep for losing reception indoors. I think the PURE Sensia is awesome with all of its features, but once again the price is killer. I think i’ll wait until the price comes down. Good informative blog. Thanks.